Surtaxed Netherlands stamps, during the early part of the German Occupation in 1940 and 1941, continued with the customary issuing of two sets of stamps each year, one for social and cultural funds during the early Summer and the other for public or child welfare funds during December. Between 1942 and 1944, only three surtaxed sets of stamps were issued, and only one of them benefited any public charity. After the surrender of Germany in 1945, the legitimate government of the Netherlands resumed issuing charity stamps on their pre-war schedules. 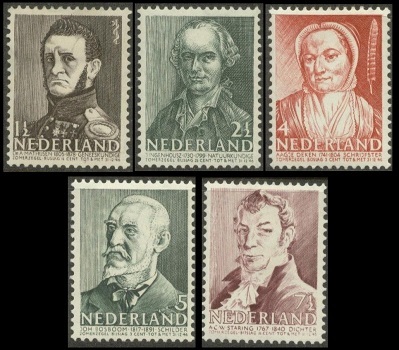 The six surtaxed Netherlands stamps shown above (NVPH #350-55, Sc. #B123-28) were issued on May 11, 1940, with the surtax benefiting social and cultural projects. The 1 1/2 C. + 1 1/2 C. denomination features Vincent van Gogh (1853-1890), the famous Dutch-born Post-Impressionist painter. The 2 1/2 C. + 2 1/2 C. denomination features Everhardus Potgieter (1808-1875), a Dutch poet and prose writer. The 3 C. + 3 C. denomination features Petrus Camper (1722-1789), a noteworthy Dutchman of many trades. During his life, he was a physician, anatomist, physiologist, midwife, zoologist, anthropologist, paleontologist, naturalist, professor, sculptor, and a conservative politician. The 5 C. + 3 C. denomination features Jan Steen (1626-1679), a Dutch genre painter of the Dutch Golden Age. This stamp was also issued in booklets. The panes of four stamps are scarce and expensive. The 7 1/2 C. + 2 1/2 C. on 5 C. + 3 C. denomination is identical to the 5 C. + 3 C. denomination described above, except for the color, which is Red, instead of Green. The 12 1/2 C. + 3 1/2 C. denomination features Joseph Scaliger (1540-1609), the French-born, Dutch religious leader and scholar. 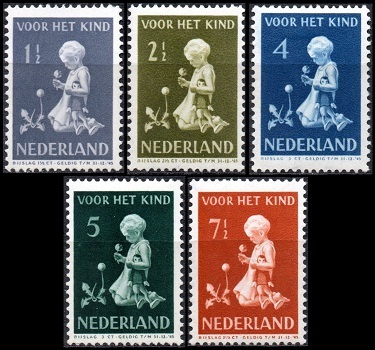 The five surtaxed child welfare Netherlands stamps shown above (NVPH #374-78, Sc. #B129-33) were issued on December 2, 1940. The surtax benefited destitute children. The design of these stamps features a little girl with flowers and a doll. 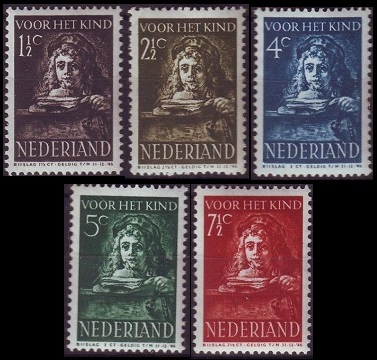 The five surtaxed Netherlands stamps shown above (NVPH #392-96, Sc. #B134-38) were issued on May 29, 1941, with the surtax benefiting social and cultural projects. The 1 1/2 C. + 1 1/2 C. denomination features Dr. Antonius Mathijsen (1805-1878), the Dutch army surgeon that first used plaster of paris to set broken bones. The 2 1/2 C. + 2 1/2 C. denomination features Dr. Jan Ingenhousz (1730-1799), the Dutch physiologist, biologist, and chemist famous for the discovery of photosynthesis. The 4 C. + 3 C. denomination features Aagje Deken (1741-1804), a Dutch writer. The 5 C. + 3 C. denomination features Johannes Bosboom (1817-1891), a Dutch painter and water-colorist of The Hague School, noted for his paintings of church interiors. The 7 1/2 C. + 3 1/2 C. denomination features Antoni Staring, Lord of Wildenborch (1767-1840), a Dutch landowner, agriculturalist, and poet. 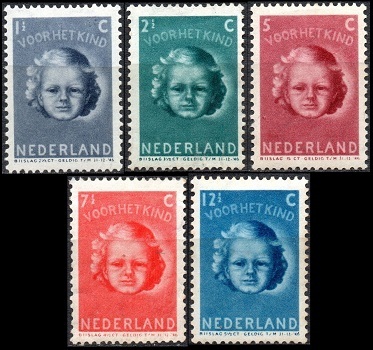 The five surtaxed child welfare Netherlands stamps shown above (NVPH #397-401, Sc. #B139-43) were issued on December 1, 1941. 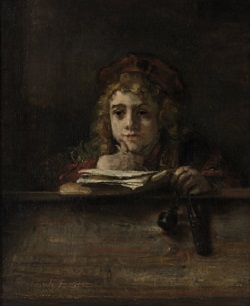 The design of these stamps features the detail of Rembrandt's 1655 painting of his 14-year-old son, Titus van Rijn, studying at his desk. The two surtaxed stamps shown above (NVPH #402-03, Sc. #B144-45) were issued on November 1, 1942, with the surtax benefiting the Netherlands Legion. 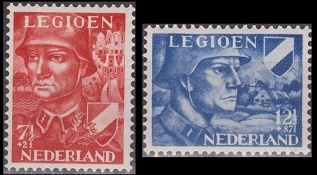 The designs of these stamps depict Dutch legionaries. These stamps were issued in regular sheet-format and in souvenir panes. The souvenir panes of the 7 1/2 C. + 2 1/2 C. denomination contained 10 stamps, and the souvenir panes of the 12 1/2 C. + 87 1/2 C. denomination contained four stamps. The Netherlands Legion was an association created in 1941 by the Netherlands National Socialist Party. Its purpose was to recruit Dutch soldiers to fight the Bolsheviks on the Eastern Front, alongside the German military. Most of them were recruited into the Waffen-SS, where they wore German Waffen-SS uniforms, but they fought as Dutch soldiers and wore Dutch military insignias. The Netherlands legion, made up of an estimated 20,000-25,000 volunteers, fought in various campaigns on the Eastern Front throughout the duration of the war. 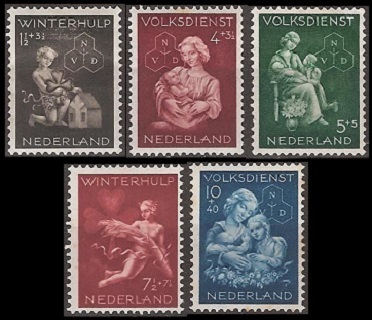 The five surtaxed "Winter Relief" Netherlands stamps shown above (NVPH #423-27, Sc. #B149-53) were issued on March 6, 1944. The surtax benefited National Social Services and the Winter Relief Fund. 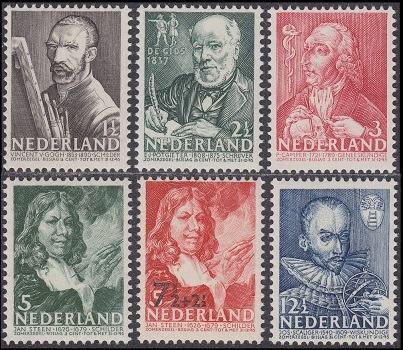 In the manner of German charity stamps, these Netherlands stamps, issued during the German occupation, were the first to have the surtax amount printed on them. The initials on these stamps, "NVD", stand for "Nederlandse Volksdienst" or "Dutch People's Service". The organization was established in 1941 by the Dutch National Socialist Party to manage all charity and social welfare, or in other words, to manage Dutch civil society. During this period, all private charities were banned. 1 1/2 C. + 3 1/2 C. - Child and a house. 4 C. + 3 1/2 C. - Mother and child. 5 C. + 5 C. - Mother and children. 7 1/2 C. + 7 1/2 C. - Child carrying a sheath of wheat. 10 C. + 40 C. - Mother and children. The five surtaxed child welfare stamps shown above (NVPH #444-48, Sc. #B154-58) were issued by the post-war government of the Netherlands on December 1, 1945. The design of these Netherlands stamps features a portrait of a little girl. The 7 1/2 C. + 7 1/2 C. denomination stamp shown above (NVPH #422, Sc. #B148) was issued on October 9, 1943 to celebrate Stamp Day, an annual national event intended to promote stamp collecting. The design features a 19th Century mail cart.